Within ProFit we could bring together different stakeholders and we all benefitted from each other. Children as end-users got their voices heard and got better playground equipment developed for them. We as scientists got better understanding of how to communicate with children, how to design for them how to observe the play value. And companies got a lot of fresh ideas for new play types and new play equipment and actually some prototypes developed for them or with them. I think that is the future of product innovation: where all stakeholders participate and contribute from their own needs and their own perspective. For the observational research three cameras were placed as unobtrusively as possible on high poles in the playground. They can be controlled from inside the canteen. This allows the children to play undisturbed, whether the cameras are in use or not. The presence of the FieldLab and the cameras is clearly marked at the entrance to the playground. When research is actually in progress, another notification sign is placed at the entrance to the observed area to warn parents and children that the cameras are on, and that children need to ask special permission from their parents to enter. 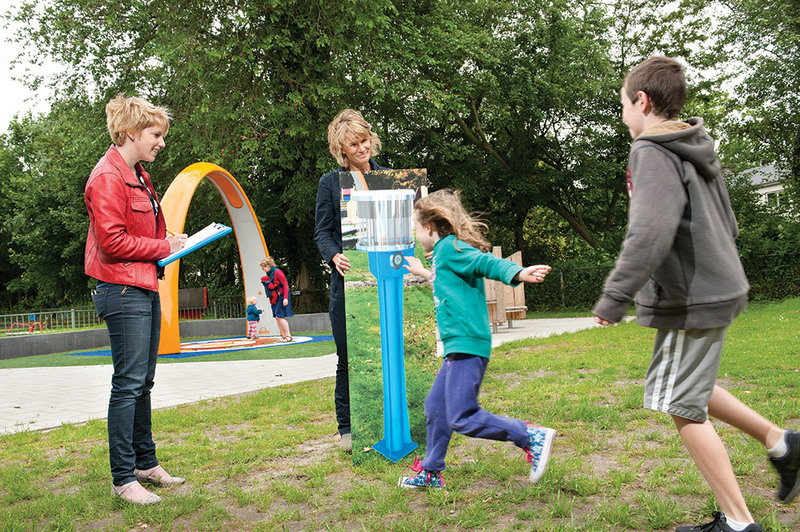 In interactive kiosk gives some more information about the FieldLab and at the same time allows for the gathering of product evaluations in a spontaneous and playful manner through filmed comments from visitors. ProFit is funded by the European Union, under the Interreg IVB North West Europe programme.